. These LC-77 ink cartridges selling here; as pictured; are the premium high yield (XL) version inks: LC-77 Black (30ml - 2400 pages) / LC-77 Cyan (19ml - 1200 pages) / LC-77 Magenta (19ml - 1200 pages) / LC-39 Yellow (19ml - 1200 pages).
. 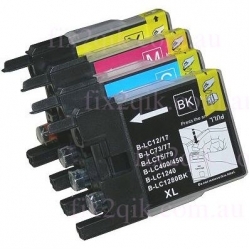 Please Note: Which refer to number of page yield of these 4 compatible cartridges is provided by its manufacturer, guaranteed to produce the same number of print and quality similar to that of a Brother genuine ink was used. In any way will NOT voiding your printer warranty.